I mic’d a 6′ grand piano with the lid open and recorded myself playing a bit of the 2nd movement of Bach’s Italiano Concerto, which happens to cover the four octaves that most pianists play in most of the time (C2 to C6) and has a range of dynamics from piano to forte. I then broke the recording into about 600 overlapping intervals 0.5 seconds long and calculated a mean spectrum for each interval. The black curve plots the peak level in each frequency bin (max. over all 600 FFT records) — like a “peak hold” applied to the spectrum for the duration of the piece. 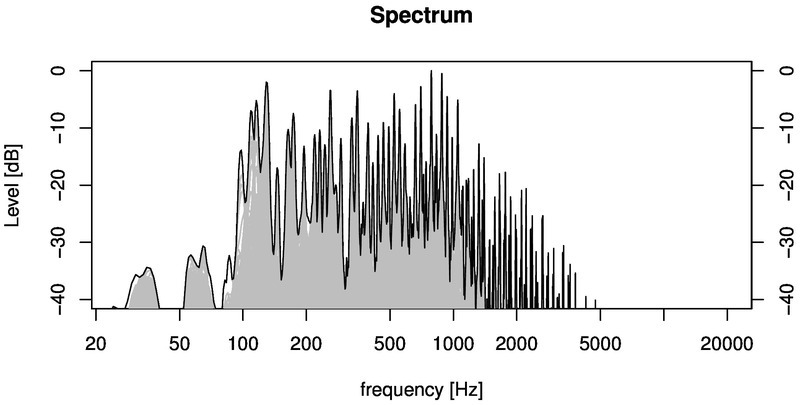 Below about 80Hz, the level never rises above -30dB relative to the peaks in the rest of the spectrum. Note that the vertical scale here is huge. The blue curve is the signal that would go to a subwoofer if we crossed over at 60Hz. At 35dB below the rest of the signal it might be just audible, but I doubt it, given the phenomenon of masking and the relative insensitivity of human hearing to low bass. The red curve is the signal that would go to a tweeter crossed over at 6kHz. At 50dB below the rest of the signal it definitely adds nothing. So this piece could be reproduced very accurately on a playback system that covers only 60Hz to 6kHz. Again, below 60Hz the level is consistently 30dB down from the rest of the signal; maybe barely audible, likely not. The signal above 6kHz is utterly negligible, except in two places where I played at ff levels in the highest octave; even there, all the extra energy is below 10kHz. But what about that 28Hz fundamental? The note A0 does have a 28Hz fundamental, but very little energy is generated at that frequency. Actually the sound pressure is dominated by the 4th harmonic (at about 110Hz), which in my measurements is 35dB louder than the fundamental and 2nd and 3rd harmonics. Our hearing apparatus perceives the 28Hz pitch via the missing fundamental phenomenon, but the tone isn’t really present and we don’t need to reproduce it. The same is true an octave up at A1: the fundamental (at 54Hz) measures 35 dB below the 2nd harmonic. This entry was posted in Digital Piano, Loudspeakers by Richard Taylor. Bookmark the permalink. There is an interesting paper describing a recording of a piano in an anechoic chamber: https://www.researchgate.net/publication/10593963. And it has a frequency domain rendering of playing A0. Thanks Mikhail! 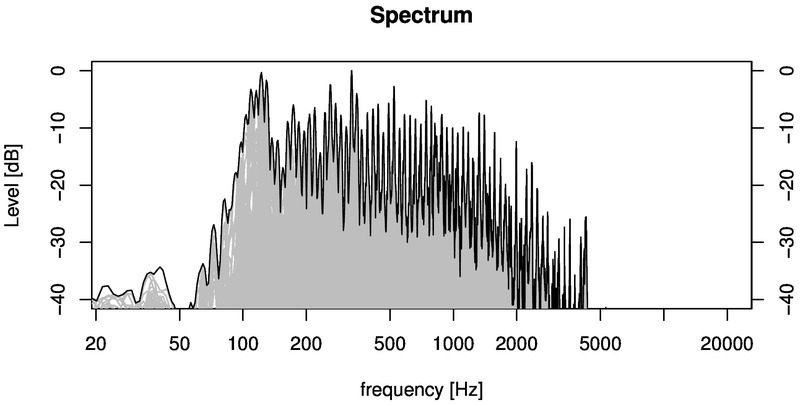 I had a look at the paper; too bad they don’t use a logarithmic frequency axis for that spectrum of A0… there isn’t enough resolution to see what’s happening in the low bass. This week I’ll try to replicate that measurement on a log scale and post it here. Alas, I don’t have a piano-sized anechoic chamber, but close miking at a few points should suffice.